Cardinal Bird Mascot. 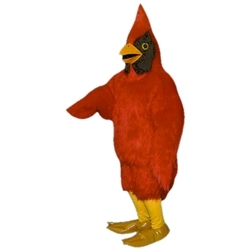 This Cardinal Bird mascot comes complete with head, body, hand mitts and foot covers. This is a sale item. Manufactured from only the finest fabrics. Fully lined and padded where needed to give a sculptured effect. Comfortable to wear and easy to maintain. All mascots are custom made. Due to the fact that all mascots are made to order, all sales are final. Delivery will be 2-4 weeks. Rush ordering is available for an additional fee. Please call us toll free for more information. 1-877-218-1289.